Bigelow Aerospace LLC, Las Vegas, NV, has begun the process of human rating its Environmental Control and Life Support System. The contained volume humans in the loop testing is in preparation for the 2015 launch of Sundancer - an expandable module approximately 27ft long, 22ft in diameter, with an internal volume of 180m3 and supports a crew of three. When completed, the process will have demonstrated the life support system s ability to safely support a crew of three persons for extended durations. Company owner Robert T. Bigelow commented, These tests are an initial foundation that verifies safety and performance of our systems. This validation process gives our customers and ourselves confidence that we are heading in the right direction and our flight systems will be safe and reliable. The development of our modules is progressing and should align with the development of commercial crew transportation. The tests are being conducted at the facilities of Orbital Technologies Corporation (ORBITEC) in Madison, WI. This system has undergone rigorous long term testing using human metabolic simulators which has shown it to be fully capable of maintaining a living and working environment. Bigelow Aerospace has volunteered their very own astronaut and Program Manager, Bill Oefelein as well as their Chief Systems Engineer, Eric Haakonstad to be the first test subjects. We believe we have developed a great system and are willing to subject ourselves to prove it Eric stated. Additional test crew members include Bigelow Aerospace and ORBITEC Environmental Control and Life Support System (ECLSS) engineers. The current testing is of shorter duration while the testing operations are refined. Future tests at ORBITEC and Bigelow Aerospace will be of substantially longer duration. At all times, heightened monitoring will ensure crew safety while metrics are collected on the performance of the systems. The specific systems integrated for the initial tests include thermal and humidity control, ventilation, carbon dioxide removal, trace contaminant removal, atmospheric monitoring, and vehicle thermal control. Additional systems will be added as they become available. This testing currently being conducted provides initial data that assures the human safety of the ECLSS hardware before it is integrated into larger operational mockups at Bigelow Aerospace. Bigelow Aerospace will use these systems in full scale, closed volume mockups to work out and demonstrate basic operation, maintenance and repair of such systems and will use them as training aides with its customers in the future. Tom Crabb, President of ORBITEC, commented that We are quite pleased with the ability to blend adequate testing and safety with a direct value-concentrated approach that keeps costs low for both development and operations. Further life support loop closure will make future Bigelow Aerospace operations even more cost effective for more customers. Bigelow Aerospace and ORBITEC are very excited to begin this work as it is yet another step in making the first commercial space station a reality. Bigelow Aerospace, LLC is a privately owned company specializing in the design, manufacture and operation of leasable Human-rated Space Complexes. With over ten years of research and development, Bigelow Aerospace is dedicated to providing affordable options for spaceflight to sovereign space agencies and corporate clients around the world. In 2006 and 2007 BA launched Genesis I and Genesis II respectively. They are orbiting prototypes of new-generation spacecraft using patented expandable habitat technology. BA s Space Station Complex Alpha will rival the usable space of the International Space Station at a fraction of the cost. Bigelow Aerospace s founder and President, Robert T. Bigelow, is a Las Vegas native who for over forty years has operated as a general contractor and developer in the Southwestern United States. Mr. Bigelow s primary activities have been in real estate development, as well as banking and finance. 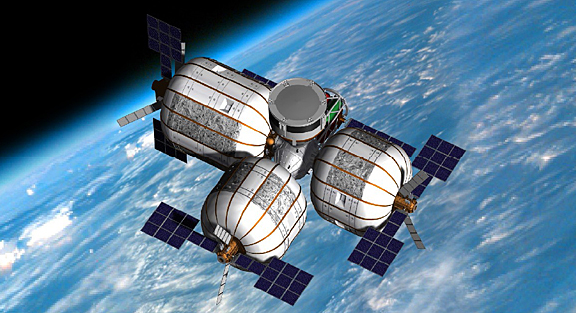 Mr. Bigelow created Bigelow Aerospace with the express purpose of revolutionizing space commerce via the development of reliable, and robust expandable space Complexes and make them commercially viable. ORBITEC is a leading high technology development and subsystem integration company based in Madison, Wisconsin. ORBITEC offers commercially mature solutions and strong capabilities in five distinct areas: Life Support and Environment Control; Next Generation Fire Suppression; Propulsion, Propellant, and Power Systems; Bio-based Products and Production Systems; and Interactive 3D Simulation Software. ORBITEC has won more than $250 million in contracts to develop state-of-the-art technologies and products. The company has been able to convert research and development initiatives into leading technologies and to mature the technologies into valuable products in their respective markets, providing significant cost advantages, superior functionality, and high reliability. ORBITEC is led by an experienced management team with over one hundred years of industry experience.